Some of the crowd at the Washington March for Our Lives. 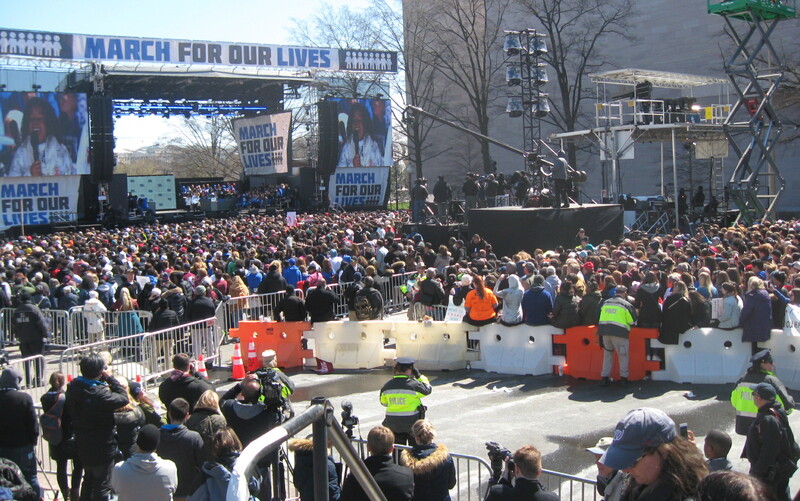 Washington – The March for Our Lives attracted thousands of students and supporters from Connecticut and hundreds of thousands from across the nation demanding change – not only in the nation’s gun laws but the makeup of Congress. The massive protest, which was echoed in 800 communities in the United States and abroad, was organized by students after 17 people were killed at Marjory Stoneman Douglas High School in Parkland, Fla., last month. But it also mobilized activists who have been fighting gun violence since 20 schoolchildren and six educators were slaughtered in Newtown a little more than five years ago. David Stowe, a founder of the Newtown Action Alliance, said the organization, working with Sandy Hook Promise, filled eight buses with 450 marchers, including more than 200 students from Newtown High School. Guilford High School students Brendan O’Callihan and Tyler Felson, who organized a group trip to Washington, D.C., for shoreline students. The push for stricter gun laws came out of the Sandy Hook Elementary School tragedy. While Connecticut and other states — the latest being Florida — have taken new steps to regulate firearms, the federal government has done little. Marchers are frustrated by what they say is the inaction of adults, especially politicians, who offer thoughts and prayers in the wake of school shootings but fail to pass legislation that protect kids from gun violence. They hope these marches will provide momentum for change ahead of the upcoming midterm elections. 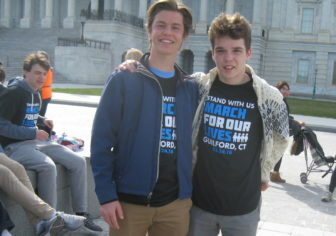 “A lot of adults have become numb to the fact that children are dying in school,” said Brendan O’Callihan, a Guilford High School student who participated in the march. Stowe said the march “may not change any votes in this Congress, but it’s going to change Congress,” as newly energized youth vote out those who refuse to change gun laws. Marchers chanted “enough is enough” and “vote them out,” and listened to speeches from those who had lost loved ones to gun violence. From an enormous stage a few blocks from the U.S. Capitol, Marjory Stoneman Douglas student Cameron Kasky read the names of classmates and teachers who died in Parkland. The list ended with Nicholas Dworet, who would have turned 18 today. Matthew Soto, brother of slain Sandy Hook Elementary School teacher Vicki Soto, took the stage to introduce two Newtown High School students, Tommy Murray and Jackson Mittleman, who promised the Parkland, Fla., students they would stand by them long after public attention had waned. Soto told the cheering crowd he was fed up with school violence. “Too many schools, too many churches, too many movie theaters, too many neighborhoods, too many homes. Enough is enough,” he said. 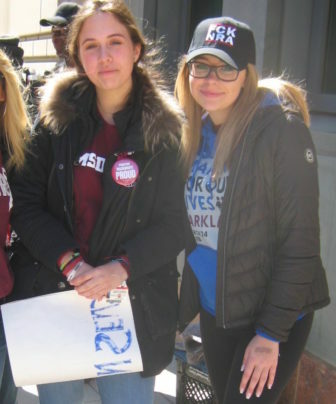 Students Naomi Rozenberg, left, and Kailey Brown were among about 900 students from Marjorie Stoneman Douglas High School in Parkland, Fla., who attended the march. The massive march of hundreds of thousands prompted the White House to issue a statement. On Friday, Attorney General Jeff Session said he will issue a ban on bump stocks, a device that allows a semi-automatic weapon to fire like a machine gun. But the marchers want a lot more, including a national ban on assault rifles and expanded background checks of gun purchasers. Kailey Brown, 15, a freshman at Marjory Stoneman Douglas and fellow student Naomi Rozenberg were among about 900 teens from that Florida school who traveled to Washington. Brown said she was marching for her niece and nephew. “They are going to go to elementary school soon, and I don’t want them to be scared at school,” she said. Marchers came from as far as California and Hawaii. But even making the trip from Connecticut was not easy. O’Callihan and fellow Guilford High School student Tyler Felson, 17, raised money to bring a group of shoreline teens to Washington through a “go-fund-me” page. Within a week, the students had raised nearly $5,600, enough to offer the round-trip by bus from Guilford to Washington for a mere $10 a ticket. 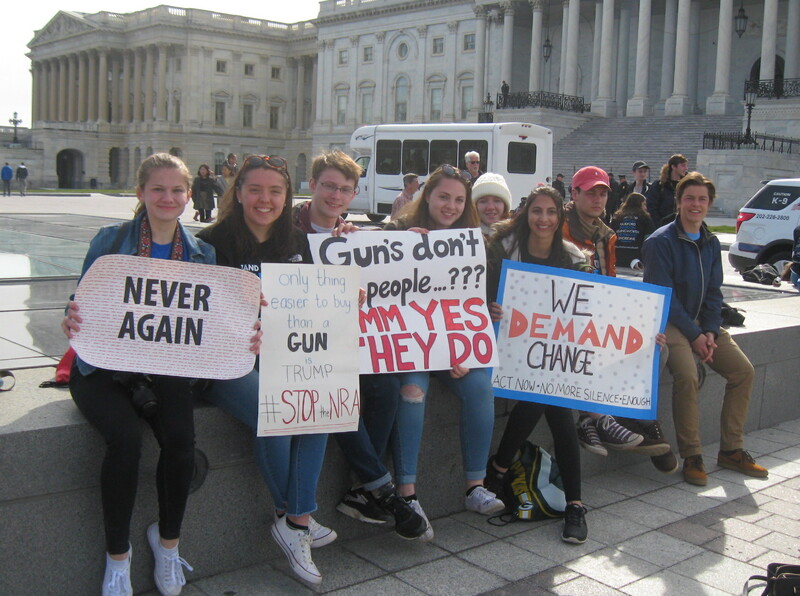 Forty-nine students made the trip, climbing on the bus at 2:30 a.m. and arriving in Washington, D.C., a little after 9 a.m.
“We have to be a part of something big, a part of democracy,” Felson said. 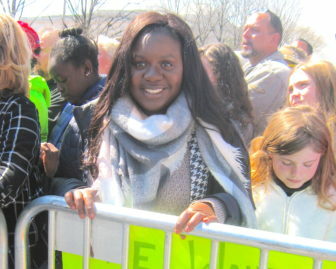 UConn senior Verlencia Somuah was among hundreds from the school attending the Washington, D.C., march. Verlencia Somuah, 20 a senior at the University of Connecticut, said she was in high school when the Newtown shooting occurred, impressing on her the need to fight against gun violence. “You don’t want to be supporting guns when the loss of one gun could have spared all those children,” she said. A number of Connecticut teachers also marched. Carol St. John, a teacher at Trumbull’s Middlebrook Elementary School, came down with 53 other educators in a bus trip organized by the Connecticut Education Association. Some of the 49 students who came to the march from Guilford.